^ Schneider, Jean. Interactive Extra-solar Planets Catalog. The Extrasolar Planets Encyclopedia. 10 September 2011 [2011-09-10]. ^ O. Struve. Proposal for a project of high-precision stellar radial velocity work. The Observatory. 1952, 72 (870): 199–200. Bibcode:1952Obs....72..199S. 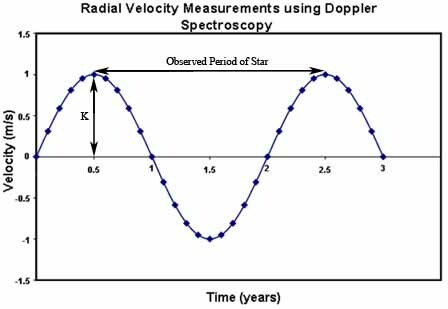 ^ 3.0 3.1 3.2 Radial velocity method. The Internet Encyclopedia of Science. [2007-04-27]. ^ P.C. Gregory. A Bayesian Kepler periodogram detects a second planet in HD 208487. Monthly Notices of the Royal Astronomical Society. 2007, 374 (4): 1321–1333. Bibcode:2007MNRAS.374.1321G. arXiv:astro-ph/0609229. doi:10.1111/j.1365-2966.2006.11240.x. ^ P.C. Gregory. A Bayesian periodogram finds evidence for three planets in HD 11964. Monthly Notices of the Royal Astronomical Society. 2007, 381 (4): 1607–1616. Bibcode:2007MNRAS.381.1607G. doi:10.1111/j.1365-2966.2007.12361.x. ^ ESPRESSO and CODEX the next generation of RV planet hunters at ESO. Chinese Academy of Sciences. 2010-10-16 [2010-10-16]. （原始内容存档于2011-07-04）.